The first time I’ve ever had baked eggplant parmesan was at my sister’s wedding tasting. I remember trying it, and it was so delicious! Fast forward a few years, and one of my friends made plain baked breaded eggplant. That was also really good! With the weather turning colder, I wanted a hot dish that was squarely in the comfort food category. After visiting my favorite local grocery store, I was very disappointed in the eggplant selection. The skin was brown and dull, and they were unappetizing to say the least. I was talking to my grandmother, and I mentioned this issue to her. She highly recommended I visit a local produce store in the area that is known for selling really good eggplant for a good price. I went to the store she recommended, and sure enough she was right! With eggplant in hand, I set off on creating this recipe. I know this is a well-known recipe, but I studied up on the best technique to make this and have created this version. A lot of people are turned off by eggplant’s bitterness, but I am happy to report that you can get rid of it :). The result is a creamy consistency, paired with the crunchiness of the breading. The sauce and the gooey cheese between the layers really marries everything together! 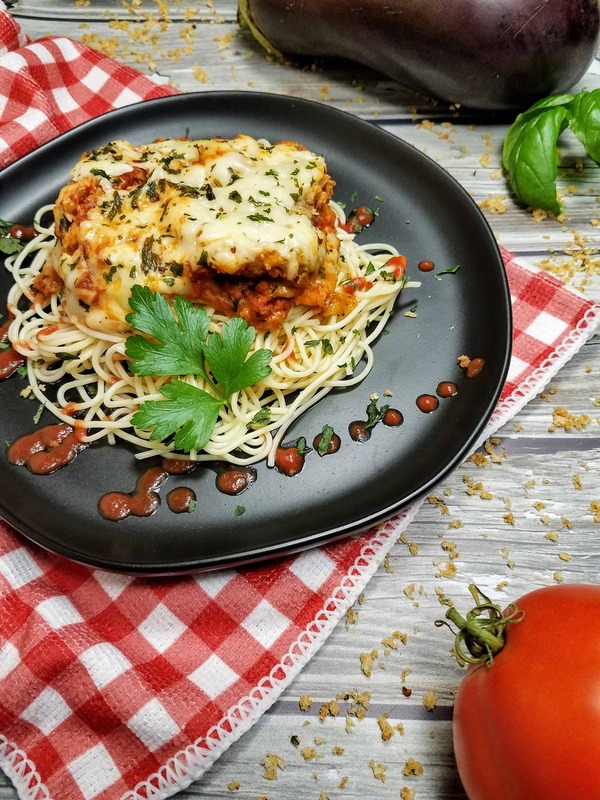 This baked eggplant parmesan is a great dish for the cool, fall nights we have been having recently! Do you have to peel eggplant before you cook it? Not necessarily. The skin of small, young eggplants is edible, while it is bitter for larger or older eggplants. 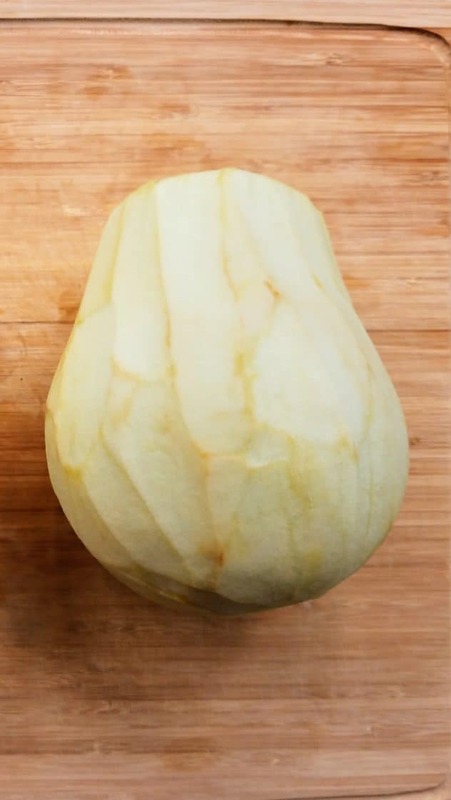 So your best bet is to always peel your eggplant (with a vegetable peeler or a paring knife) to avoid bitterness. How do I avoid the bitter taste of eggplant? There are a couple of things to do. The first, is that there are male and female eggplants. The way to distinguish between the two, is to check out the the bottom where the brown spot is (on the end opposite end the stem). The female eggplants will have what looks like a slot (eggplant on the left), whereas the male eggplants will have a circular spot (eggplant on the right). The male eggplants also supposedly have less seeds. The second thing you can do, is to sweat the eggplant. I describe that process below in step 3. Do you salt both sides of eggplant? Yes! When sweating the eggplant, it is important to salt both sides of the eggplant. To sweat the eggplant, I use either Kosher salt or table salt. 1. Start by chopping the stem end off of the eggplant. 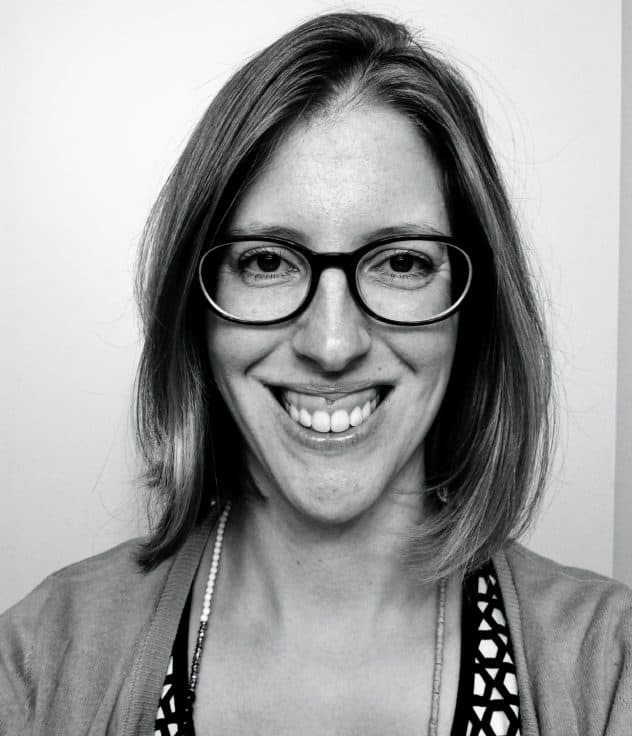 Depending on how big the dimple is at the bottom, you might have to cut that off as well. Then, using either a vegetable peeler or a paring knife, peel the eggplant. 2. Using a chef’s knife, slice the eggplant into 1/4″ slices, lengthwise. A lot of recipes call for cutting the eggplant into round medallions, but cutting it lengthwise is better for a few reasons. First, by cutting it lengthwise, there will be fewer pieces to coat and bake. Second, there will be less gaps between the eggplant pieces in a layer, resulting in a more even taste and creamier texture. 3. Next, it’s important to sweat the eggplant. You know…sweat it like it’s doing total body cardio in 21 day fix! Lay a few layers of paper towels down (I laid them on my cutting board), then sprinkle them generously with a lot of salt. Arrange the eggplant slices on top, and then sprinkle them with lots of salt. I have a lot of Kosher salt laying around (a box of it in fact), so that is what I used. You can also just use regular old table salt. 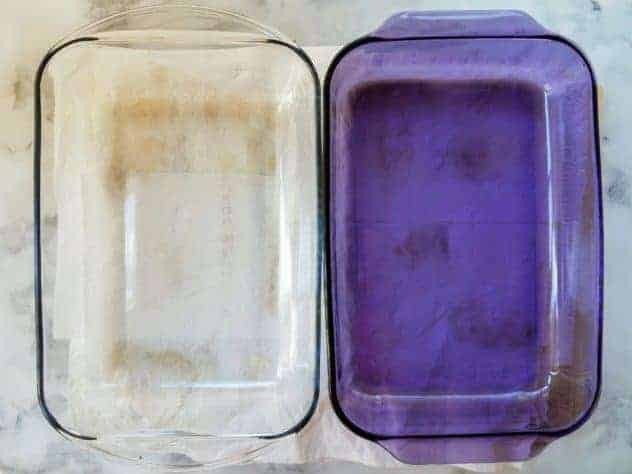 Cover the salted eggplants with a few more layers of paper towels, and then put either some pots and pans, or 9″ x 13″ glass pans on top to apply some pressure. 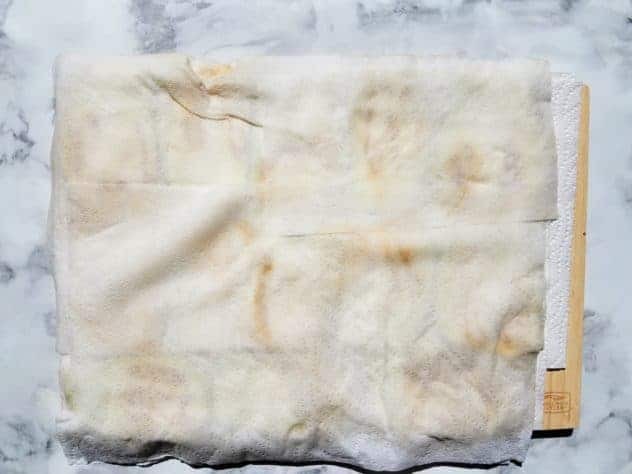 The purpose of the salt is to draw out the moisture (and any bitterness), and the purpose of the paper towels is to soak up the moisture that is drawn out. The weight on top helps to squeeze out even more moisture. The result is a very creamy texture, without the bitterness. 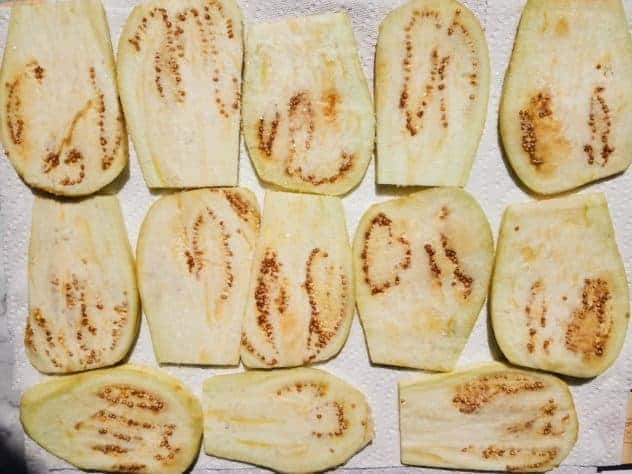 I sweated the eggplant slices for 60 minutes. You can see in the last photo, that the paper towels are soaked! After sweating, remove the paper towels and rinse all of the salt off the eggplants under running water. Dry off eggplants with more paper towels. Make sure they are completely dry before moving onto the next step. Now is the time to turn on the oven, and preheat to 450F. 4. To efficiently bread the eggplant slices, it’s easiest to set up an assembly line of sorts. Or in my case because I had to take photos, an assembly circle :). You will need a bowl with all-purpose flour, a bowl with whisked eggs, and a bowl with seasoned breadcrumbs. I used my homemade shake and bake recipe as the coating. If you are going to do this, be sure to pulse the panko bread crumbs in a food processor to grind them up. This will ensure a nice coating on the eggplant, that will crisp up nicely in the oven. The easiest way to handle the eggplant through the breading process is to use salad tongs. First pick up your eggplant slice and coat both sides with flour. Shake off any excess. Next, dip both sides into the egg and allow the excess to drip off. The last step is to coat it with breadcrumbs, again, shaking off any excess. Arrange the breaded eggplant slices on a baking sheet. Bake for 7 minutes at 450F. Flip slices and bake for an additional 5-7 minutes, or until crispy. Remove from oven and set aside. Decrease the oven temperature to 350F. I cracked my oven door while completing step 5, in order to let it cool down a little bit. 5. 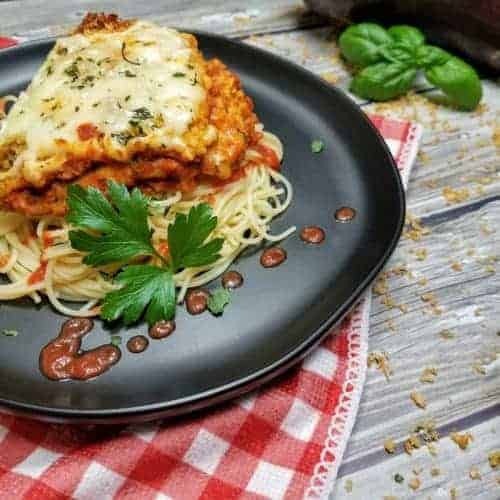 The layers of eggplant parmesan are (starting from the bottom, moving to the top): sauce, baked breaded eggplant, cheese and spices, sauce, baked breaded eggplant, cheese and spices. In a 9″ x 13″ pan, spread a thin layer of sauce. Arrange the baked breaded eggplant slices in a layer, with minimal gaps. It’s ok to overlap them a little. Top with half of mozzarella and parmesan, and sprinkle some spices. I used basil and parsley. Repeat this layering one more time, ending with the cheese and spices on top. 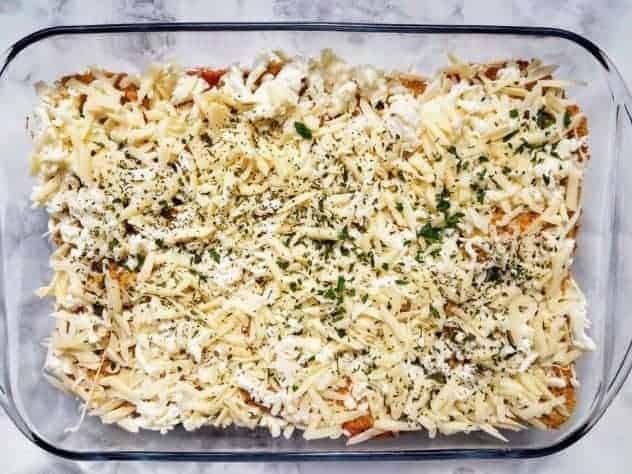 Now, your casserole will not look like the photo below on the left. I purposely left sections out, so that you can see the clear layering of sauce–>breaded eggplant–>cheese and spices. 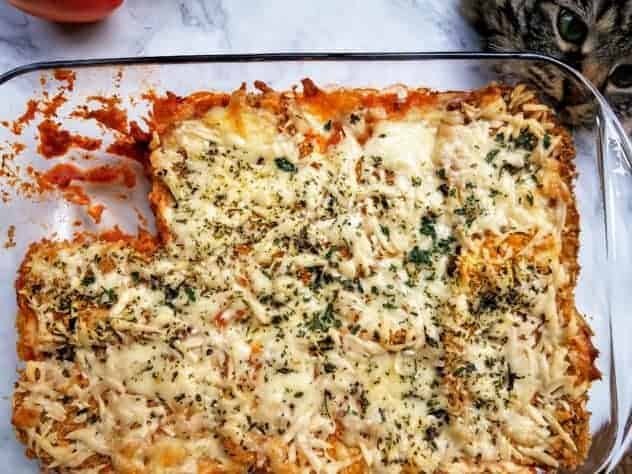 This baked eggplant parmesan is the perfect comfort food for a cool, fall night! The meaty and creamy texture of the eggplant makes the dish very filling! Serve over angel hair pasta. 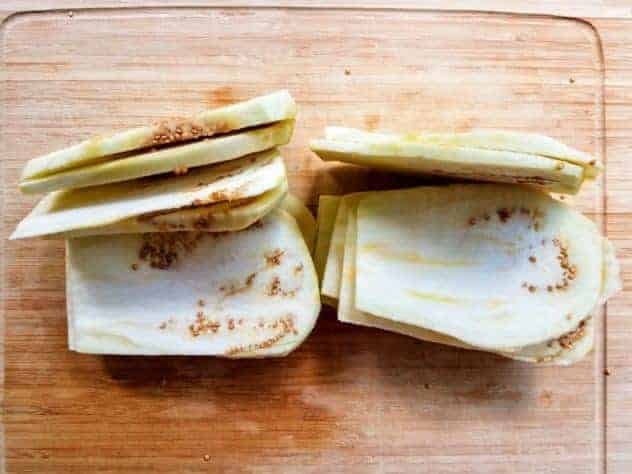 1 large eggplant, peeled and sliced 1/4"
Lay down a few layers of paper towels, sprinkle them generously with a lot of salt. Arrange eggplant slices on top, sprinkle them with a lot of salt, and top with a few more layers of paper towels. Place heavy pots and pans on top to apply pressure. Allow the eggplant to sweat for 60 minutes. After sweating, rinse all of the salt off, and dry completely with paper towels. Set up breading assembly line by putting the flour, eggs, and homemade shake and bake (or breadcrumbs) each in a separate bowl. Bread eggplant slices by first coating both sides in flour and shaking off the excess. Then dip both sides in egg, allowing any excess to drip off. Then coat both sides with breadcrumbs, shaking off the excess. 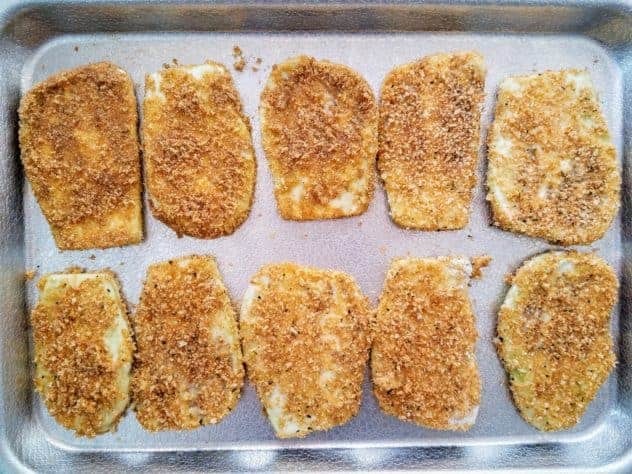 Arrange the breaded eggplant slices on a baking sheet. Bake for 7 minutes at 450F. Flip slices and bake for an additional 5-7 minutes, or until crispy. Remove from oven and set aside. Decrease oven temperature to 350F. In a 9" x 13" pan, spread a thin layer of sauce. Arrange the breaded eggplant slices in a layer, with minimal gaps. It's ok to overlap them a little. Top with half of the mozzarella and parmesan, and sprinkle some basil and parsley. Repeat this layering one more time, ending with the cheese and spices on top. Place the 9" x 13" pan in the oven and bake for 35 minutes or until golden brown on top and/or the edges. If desired, serve over a bed of cooked angel hair pasta. 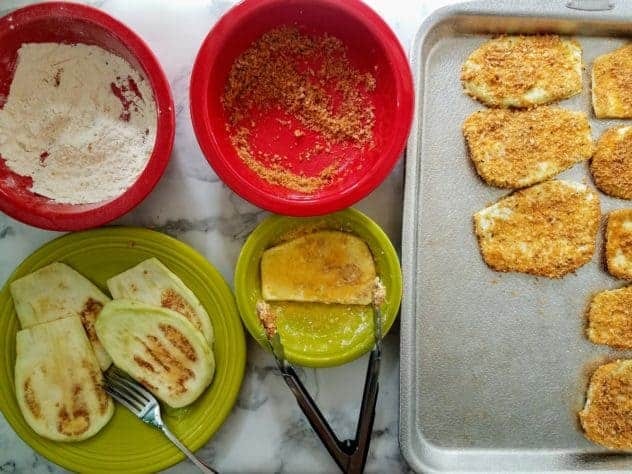 To make gluten-free: Use gluten-free Panko breadcrumbs, which are available at the supermarket. I’m already hungry looking at this recipe! But it’s a good recipe for a cool autumn day. Love this recipe for Baked Eggplant Parmesan. It looks relatively easy to make yet packed with lots of flavor. I used to love getting eggplant parm at restaruants but if I can make it at home that would be a great dinner for us. Going to print this for sure! Exceptional recipe. I was never a huge fan of eggplant but this looks very tasty, I have recently started a Keto diet and am curious how it would taste if I were to substitute the all-purpose flour for almond flour. I would also have to remove the bread crumbs… Would you have any good Keto friendly recipes? 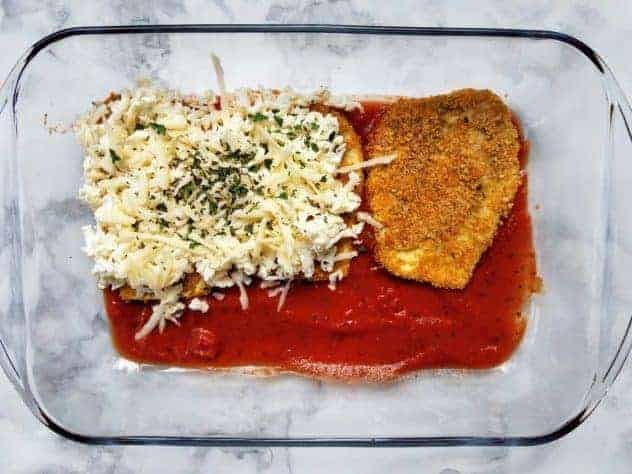 Oh I love eggplant parm and this version looks amazing!! Now, this makes my tummy troubles and want to go home and cook this dish. 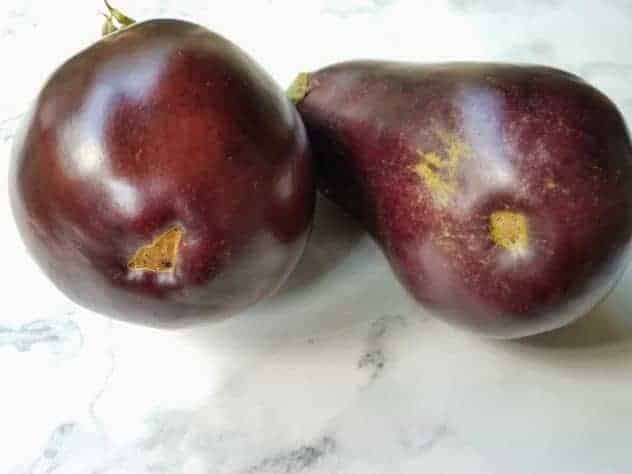 I love eggplant but I have not tried this dish, let me check on the recipe and cook this soon. THanks for posting. Nice! I like eggplant parmesan but have never attempted it mostly because I’v never made eggplant at all. This reads simple enough but I just need tofind a sub for cheese and I’m not too sold on vegan cheese. Sigh. Love eggplant! Pinned and can’t wait to try it! U r awesome. I always go for light dinner. This is gonna b my dinner tonight. I love how you answer all the questions an eggplant beginning would have because I had no idea about most of these things when preparing eggplant! And this recipe looks so good! This is a fabulous post! Thank you for making my wife and I’s choice for dinner tonight simple. We’ve only made eggplant a couple of times, but with these instructions, I’m sure we’ll be fine. I don’t like eggplant, personally, but this still looks delicious! I could see making a similar dish with some large zucchini boats, and having it come out just as delicious as this looks.